I like to listen to stand-up, but haven't in a long time. I went through the typical college phase of listening not only to what was popular and current at the time (Dane Cook, Mitch Hedberg), but digging into my dads collection and getting to know the stuff he was into (mainly Eddie Murphy, but there was plenty of Steven Wright and Steve Martin in there as well). Over the last few years I've dabbled in some of the more popular stuff like Aziz Ansari, Louis C.K. and Bo Burnham, but haven't explored the current scene as much as I would like to. That is, until I started listening to the top comedy tracks inside the Spotify app on my phone. This led me to not only appreciate the variety of personalities and insight I was missing out on, but also served as an introduction to Tig Notaro. I didn't know much about Notaro or what her story was other than that I'd seen her in Lake Bell's 2013 directorial effort, In a World..., but I liked her stand-up almost immediately given the first thing I heard was her story concerning Taylor Dayne. This immediate affection wasn't necessarily because I'm also a fan of Dayne (though "Tell it to My Heart" really is just the best), but because it allowed Notaro to put herself in her place. She understands where she stands in relation to Dayne as far as the pop culture pantheon is concerned and in relaying this story of unironic fandom she became one of us by divulging a piece of information most might consider at least somewhat embarrassing and going even further by consistently being shameless in her approach to how much Dayne's music meant to her in her formative years. As I continued listening to more of Notaro's material it became evident from her two album discography that some major things had occurred in her life between the release of her first and second albums. And so, when I came scrolling across this documentary simply titled Tig on Netflix the other day, I was more than thrilled to have access not only to what was going through Notaro's mind at the time multiple crises were taking place in her life, but how she's been since and what she's been up to. If you want the long version, go ahead and buy Live, but the abbreviated version is that this documentary follows Notaro, a Los Angeles based comedian, who went onstage days after being diagnosed with invasive stage II breast cancer and performed a stand-up set that would become the point in her life for which she would look at everything before it and everything that came after. With the likes of Ed Helms and Louis C.K. waiting in the wings this set, that took place at the Largo theater which doesn't allow video recording, became legendary overnight due to these celebrities tweeting about it. The grand irony of Notaro's situation is of course that she became more famous and celebrated than ever after seemingly coming face to face with death and not being able to bask in that success. The set itself is more of a conversation than a well-prepared piece of comedy for entertainment purposes which only endears us to Notaro all the more. Directors Kristina Goolsby and Ashley York sprinkle different tracks from the set throughout the film to give a sense of Notaro's headspace at the time of the performance as her life continues and we see her grow from where she once was to where she currently is. Being able to explore Tig's journey as her life unfolds in unexpected ways while in the realm of stand-up is what makes the documentary appealing. Cancer is deemed so serious, but especially for those who deal with the disease first hand it has to feel good to be able to laugh about it once in a while. We are up to date on the tumultuous year Notaro had in 2012 by the half hour mark and so I was unsure where the rest of the doc may go or even if it had enough things to say to sustain itself. It certainly does. Concerning itself with the lessons learned from the bleaker sides of life only makes Notaro more admirable and her documentary more satisfying. Ultimately, what Tig comes around to pointing out is the reciprocating nature of life. This thesis isn't situated as neatly as what a fiction narrative might present, but it gets it's point across in a more profound way because of it. We are informed early on that Notaro not only learns she has clostridium difficile, but that her mother has passed away in a kind of freak accident. This world-shattering news seems to only be the beginning though as Notaro learns almost in immediate succession of burying her mother that she has cancer. It is a shitstorm of bad circumstances culminating at a single point in a person's life that would be more than enough to bury someone let alone make them more welcoming to the world around them. With her ability to be able to express herself through the art of stand-up that she clearly adores though, Notaro is allowed an outlet for the pain she is feeling. Notaro probably says it best in her set where she discusses the equation for comedy being one of tragedy plus time. Notaro didn't have the time portion of the equation though and so it seems to come down to stand-up being a necessary place to share the countless thoughts and injustices rushing through her mind at the time. Of course, she approaches these subjects with a measured perspective and thus turns them into something special as far as her brand of comedy and, more specifically, her timing. As far as her actual stand-up is concerned, if nothing else comes through in this documentary (and it very well should) it is how masterful Notaro is in playing off her audience and taking her time to let the joke really breathe. It's really rather remarkable and takes a huge amount of confidence to be able to pull off. You wouldn't expect this rather meek-looking woman to possess such a power, but by learning of her life story her comedy becomes even more insightful if not even funnier than when taken at face value. This film itself is a hybrid of comedy and drama that intends to capture a personal journey about facing crisis and being able to deal and cope with it. It is a story to reassure those who have it rough or think they have it rough that it can always be worse and that there might even be a light at the end of the tunnel. What doesn't make this hackneyed or cliche though is the honesty with which it is conveyed. We truly feel we grow to know the real, authentic Notaro and because of that we feel a sense of accomplishment when she is able to move forward during a period in her life when she didn't know what the future may hold for her. Tig is a revealing, but well mannered documentary in that it is nothing less than sincere. 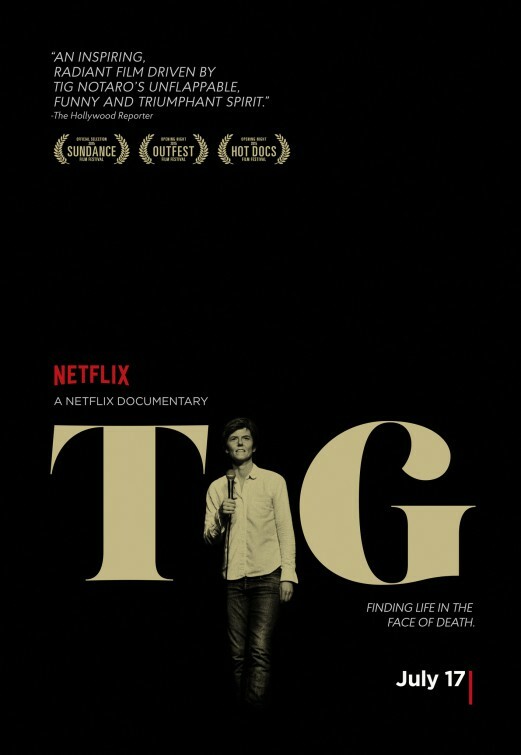 It may not move you as much as you expect the first time around (or it may grab you hook, line and sinker-who knows), but if it drives you to listen to more Tig Notaro stand-up which inevitably draws you closer to the person Notaro is you'll have no choice but to reflect on the documentary and realize how reassuring it is to live in an age where such stories can be told and shared.